A few month’s ago, Nancy created a personality quiz to pair Kidsmomo readers with their Valentine’s Day Book Match. Obviously, I couldn’t let you guys have all the fun, so I decided to give it a try for myself. And guess what, you guys — Nancy’s quiz is GENIUS. 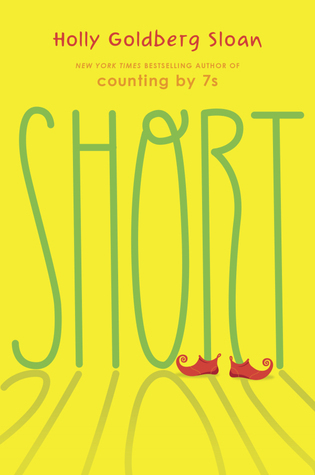 Because I got matched with Short by Holly Goldberg Sloan, and I really, really, really, REALLY loved it! The book is about Julia, who is in middle school but always gets mistaken for being younger. Why? Well — in case the title wasn’t a giveaway — Julia is short. In fact, she’s so small, she can still climb through the family’s doggie door! But at the moment, that’s not the issue weighing most on Julia’s mind. At the start of the story, she’s most concerned about the loss of her dog, Ramon. With her two best friends away all summer, it’s going to be hard for Julia to cope with Ramon’s recent death. And to make matters worse, her mother is forcing Julia to audition for a community production of The Wizard of Oz. Julia is decidedly NOT interested in being on stage, but she’s compelled to go along with her younger brother (and talented singer), Randy. Lo and behold — both of them get cast as Munchkins. And soon, Julia starts finding her place as part of the theater community. I don’t want to give away any details, but I will say that I absolutely loved all of Julia’s behind-the-scenes adventures as she gets involved in things like costume design, flying monkey casting, and actor gossip. To be honest, I always like stories that offer a peek into what goes on behind the curtains in the theater world. But in the case of Short, I particularly enjoyed seeing everything through Julia’s eyes — and through her unique and often hilarious narration. And not only is Julia a fully rounded character, but so are all the adults involved with the show — from the eccentric director with a particular vision, to Julia’s Munchkin partner, Olive, an actress with dwarfism. With the school year ending soon, you may be working on your own summer plans right now. I suggest you include reading Short on your list! But also, what are your summer plans? Going to camp? Traveling somewhere fun for vacation? Staying home and taking cool classes like robotics or art or sports? Leave a comment and share what you’re up to! Karen doesn’t have any big vacations planned for the summer, but she wants to do some little weekend trips. Any suggestions? Thank you for this review. I bought this book for my classroom library! better nate than ever! AWESOME BOOK! !